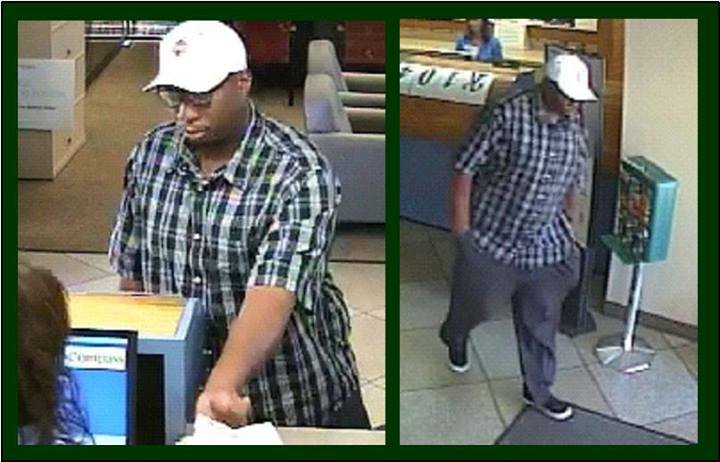 The Jacksonville Sheriff’s Office is asking for the community’s assistance in identifying a bank robbery suspect. At approximately 9:00 a.m. on Tuesday, Sept. 27th, a bank robbery was reported at the BBT Bank located at 9610 Hutchinson park. The suspect reportedly entered the bank, approached an employee and demanded cash. The employee complied with the demands and the suspect fled the area on foot. No suspect vehicle was observed by witnesses. The suspect was described as a Black Male, 5’8” tall with a slim build. 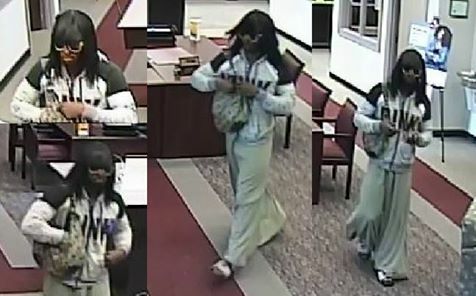 He dressed as a female wearing a black wig, yellow sunglasses, a gray hoodie type sweatshirt and a long gray skirt/dress. 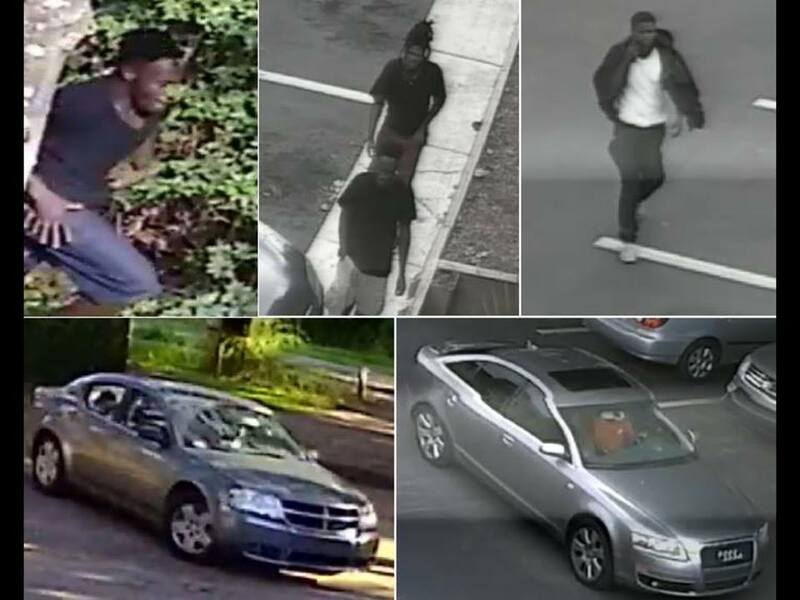 The Jacksonville Sheriff's Office is asking the community for assistance in identifying several individuals wanted in connection with an armed robbery. On Tuesday, June 14, 2016, the victim reported he was robbed at gunpoint while walking through an apartment complex parking lot in the 5800 block of University Boulevard West. Surveillance video captured the suspects prior to and following the incident. The pictured vehicles are believed to have been used during the robbery. Anyone who has any information in regards to the identity of the pictured suspects or vehicles is asked to contact the Jacksonville Sheriff's Office at 904-630-0500 or email them at JSOCrimeTips@jaxsheriff.org. To remain anonymous and receive a possible reward up to $3,000 contact First Coast Crime Stoppers at 1-866-845-8477. On Wednesday, June 15, 2016 at 11:24 a.m. police were dispatched to Chase Bank located at 6012 San Jose Boulevard reference an armed bank robbery. The suspect walked into the bank and approached two bank tellers at the front counter, pointed a small silver handgun at them and demanded money. The suspect walked the two tellers and a customer to a rear door inside the bank where the teller dispensed an undisclosed amount of cash and handed it to the suspect. 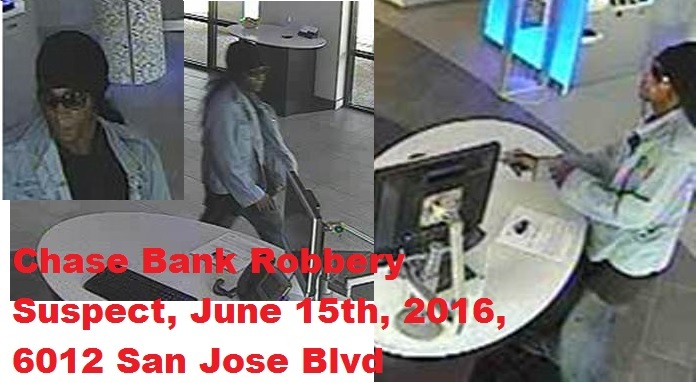 Upon receiving the cash, the suspect fled the bank on foot and headed south of the bank on San Jose Boulevard. The suspect is described as a black male in his 30’s, 5’9-6’0, 160-180 pounds, wearing a denim jacket, dark shirt, dark pants, long dark wig and large black sunglasses. No suspect vehicle was observed during the incident. Anyone with any information reference the identity of this robbery suspect is asked to contact the Jacksonville Sheriff's Office at 904-630-0500 or email them at JSOCrimeTips@jaxsheriff.org. To remain anonymous and receive a possible reward up to $3,000 contact First Coast Crime Stoppers at 1-866-845-8477. On 5/30/16 at approximately 2:15am, 2 masked intruders entered the McDonalds restaurant located at 435 Atlantic Blvd. The suspects were wearing all black; black hoodies, black pants, black shoes, ski masks, and had light colored gloves on their hands. They were both armed with black handguns. Both suspects left the restaurant property on foot, after taking an undisclosed amount of money. The Atlantic Beach Police Department Investigations Division is asking that anyone with information regarding this robbery please contact 904-247-5859, or call First Coast Crime Stoppers at 1-866-845-TIPS (8477). You will remain anonymous and could be eligible for a cash reward up to $3,000. The Jacksonville Sheriff's Office is asking for the community's assistance in identifying a robbery suspect that struck on the City's Southside. 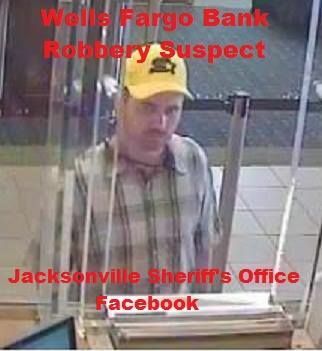 On Tuesday, March 29, 2016 at approximately 9:41 a.m. the Jacksonville Sheriff's Office was dispatched to the 6200 block of St. Augustine Road in reference to an attempted bank robbery. Investigation revealed the suspect entered the bank and approached the front counter. 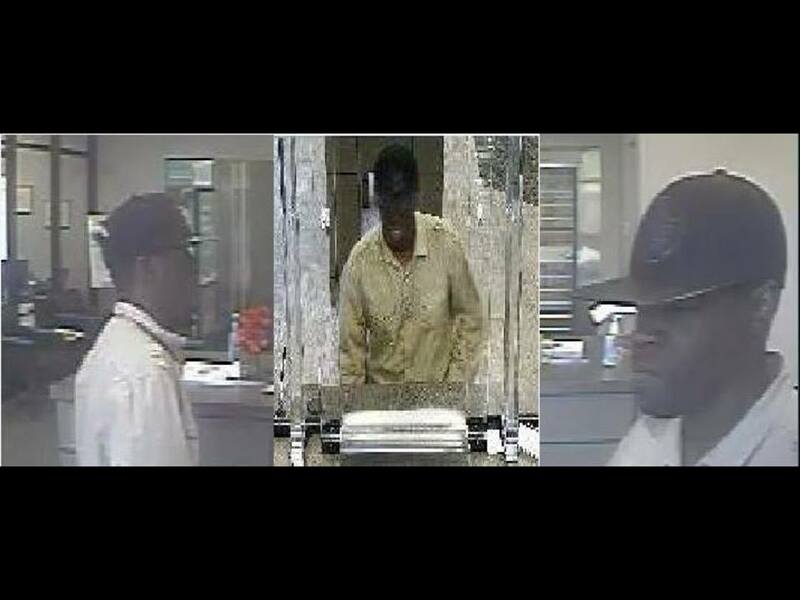 A bank employee told... the suspect to take his hat off before she would help him. The suspect held up a hand written note demanding money. The employee again told the suspect to remove his hat. The suspect then turned and left the bank. The suspect was last seen on foot fleeing the area. He is described as a black male approximately 5'6"-5'7" and 175 pounds. He was last seen wearing a black baseball cap, tan long sleeved shirt and blue jeans. There were no weapons displayed by the suspect during the attempted robbery. Anyone who has any information in regards to the identity of this suspect is asked to contact the Jacksonville Sheriff's Office at 904-630-0500 or email them at JSOCrimeTips@jaxsheriff.org. To remain anonymous and receive a possible reward up to $3,000 contact First Coast Crime Stoppers at 1-866-845-8477. On Wednesday, March 9, 2016 at 2:15 p.m. an unknown suspect entered Suntrust located at 6375 St. Augustine Road. The suspect presented a note to the teller indicating he had a gun. The noted contained demands for money and the teller complied. The suspect fled the bank on foot. The suspect is described as a black male, 5’6” to 5’8”, 160 pounds, dark shirt, blue jeans, dark shoes, white baseball hat. Anyone with any information in reference to the identity or location of this robbery suspect is asked to contact the Jacksonville Sheriff's Office at 904-630-0500 or email them at JSOCrimeTips@jaxsheriff.org. To remain anonymous and receive a possible reward up to $3,000 contact First Coast Crime Stoppers at 1-866-845-TIPS(8477). 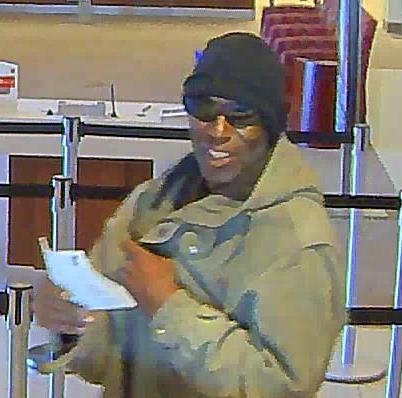 This man attempted a bank robbery at Wells Fargo located at 1336 W. Edgewood Avenue on Monday, February 8th. At least he smiled for the camera. Anyone with any information in reference to the identity of this unknown suspect is asked to contact the Jacksonville Sheriff's Office at 904-630-0500 or email them at JSOCrimeTips@jaxsheriff.org. To remain anonymous and receive a possible reward up to $3,000 contact First Coast Crime Stoppers at 1-866-845-TIPS (8477). 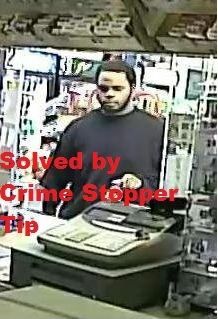 On Monday, July 6, 2015 at 5:16 a.m., an unknown suspect entered the CVS located at 5999 Normandy Boulevard and approached the counter. The suspect placed a pack of fruit flavored Mentos on the counter and revealed a shiny object in his waistband then lowered his shirt quickly. The suspect demanded the clerk not look at him and give him a plastic bag. The suspect ordered the clerk to place money in the bag. The s...uspect told the clerk that he did not want any change. The suspect fled the business on foot. The suspect was described as a black male, 37-42 years old, 5’11”, 190 pounds, wearing a camouflage cap, dark gray collared shirt, faded blue pants and blue slide style shoes. Anyone who has any information in regards to the identity or location of this suspect is asked to contact the Jacksonville Sheriff's Office at 904-630-0500 or email them at JSOCrimeTips@jaxsheriff.org. To remain anonymous and receive a possible reward up to $3,000 contact Crime Stoppers at 1-866-845-TIPS(8477). JAX Convenience Store Robbery Lake Shore Blvd. 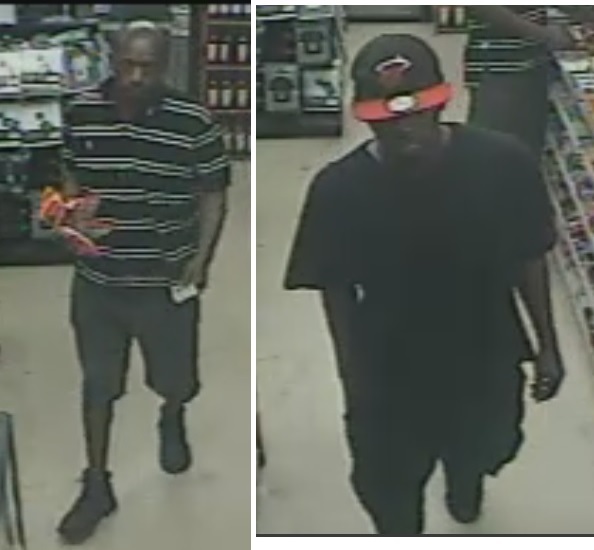 On Saturday, July 4, 2015 at 7:17 p.m. an armed robbery occurred at JAX Convenience Food Store located at 3467 Lake Shore Boulevard. The suspect entered the store and asked the clerk for a watermelon flavored Arizona beverage. The clerk assisted him, handed him the drink and returned behind the counter. The suspect then displayed a small handgun and demanded money from the register. The suspect fled on foot. On Monday, July 6, 2015 at 2:23 a.m. an armed robbery occurred at Gate located at 1001 Monument Road. The suspect stated, “Listen here, this isn’t your money. Don’t be a hero and give me all of the money out of the register.” The suspect lifted his shirt and displayed a black handgun in his waistband while making demands. The suspect fled the business on foot in an unknown direction. The suspect was described as a b...lack male, 5’2”, 150 pounds, late 30's to 40’s, medium complexion, baggy red t-shirt, faded black shorts, white t-shirt wrapped around his left upper arm (possibly concealing a tattoo), large frame sunglasses and a black wide brim hat. Anyone who has any information in regards to the identity or location of this suspect is asked to contact the Jacksonville Sheriff's Office at 904-630-0500 or email us at JSOCrimeTips@jaxsheriff.org. To remain anonymous and receive a possible reward up to $3,000 contact Crime Stoppers at 1-866-845-TIPS. On Thursday, January 15, 2015 a robbery was reported to the business of Metro PCS at 5912 Beach Boulevard. Investigation revealed the suspect entered the business and gave an employee a note that implied he had a gun and demanded money. The employee complied with the suspect and gave him the money. The suspect fled to an awaiting red four door vehicle and entered the passenger side. A second suspect was waiting in the vehicle and drove it from the scene. The suspect that entered the business was described as an Arabic or Middle Eastern male between 35-45 years old, 5’11”, 180-200 pounds, with facial hair. There is no description available on the driver of the vehicle. Anyone who has any information in regards to the identity or location of these robbery suspects is asked to contact the Jacksonville Sheriff's Office at 904-630-0500 or email us at JSOCrimeTips@jaxsheriff.org. To remain anonymous and receive a possible reward up to $3,000 contact Crime Stoppers at 1-866-845-TIPS. Armed Robbery at Kangaroo on Beach Blvd. The Jacksonville Sheriff's Office is asking for the community's assistance in attempting to identify an armed robbery suspect. 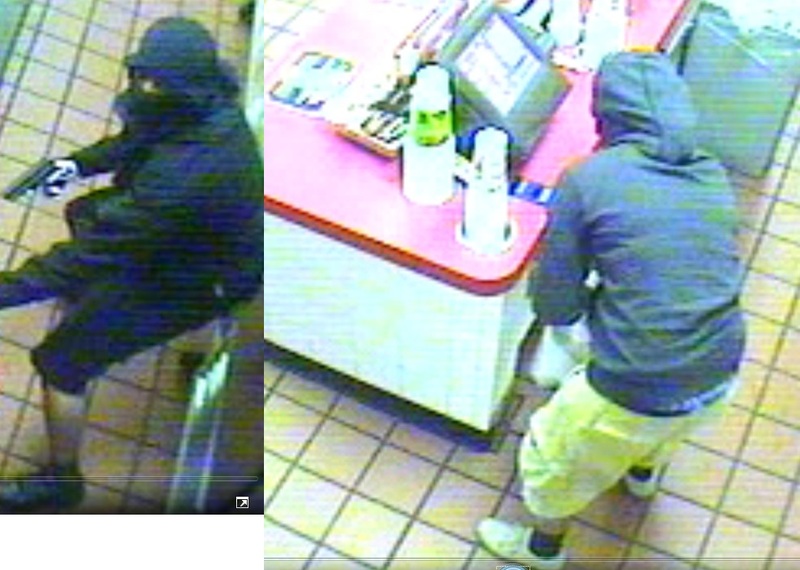 On Sunday, December 21, 2014 at approximately 7:30 a.m. a robbery was reported at the Kangaroo located in the 13600 block of Beach Boulevard. The suspect reportedly entered the business and asked for cigarettes. He placed a gun on the counter and demanded money from the registers as well as cartons of cigarettes. The clerk complied with demands, placing the items in a bag. The suspect was last seen fleeing to a waiting vehicle parked behind the business. The vehicle is described as a green truck with a topper or a green van. The suspect has been described as a black male approximately 37 years old. He was said to about 6'2" tall and weighing around 195 lbs. Anyone who has any information in regards to the identity of this wanted suspect is asked to contact the Jacksonville Sheriff's Office at 904-630-0500 or email us at JSOCrimeTips@jaxsheriff.org. To remain anonymous and receive a possible reward up to $3,000 contact Crime Stoppers at 1-866-845-TIPS. 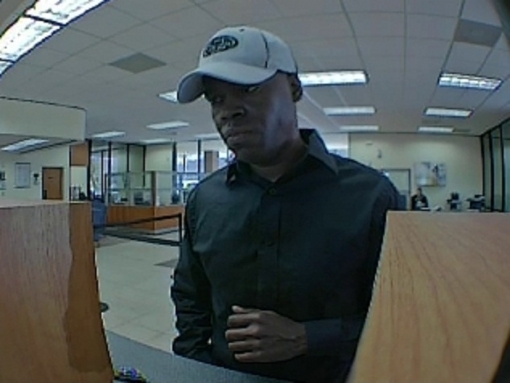 On Wednesday, September 17, 2014 police responded to a bank robbery at Fifth Third Bank located at 14420 Beach Boulevard. Suspect is described as a white male, 30-35 years old, 5'5", 130 pounds, black hair, goatee, wearing a white shirt and black pants. Anyone who has any information in regards to the identity of this wanted bank robbery suspect is asked to contact the Jacksonville Sheriff's Office at 904-630-0500. You can email us at JSOCrimeTips@jaxsheriff.org. To remain anonymous and receive a possible reward up to $3,000 contact Crime Stoppers at 1-866-845-TIPS. 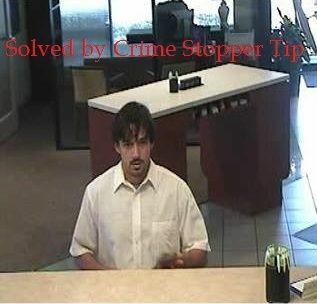 On Wednesday, June 25, 2014 at 11:08 a.m. an unknown white male suspect attempted to rob the Wells Fargo located at 11415 Beach Boulevard. The suspect demanded money from the teller, the teller did not comply, and the suspect ran out of the business into the woods located behind the bank. A weapon was not displayed or threatened. Anyone who has any information in regards to the identity of this attempted bank robbery suspect is asked to contact the Jacksonville Sheriff's Office at 904-630-0500 or email us at JSOCrimeTips@jaxsheriff.org. To remain anonymous and receive a possible reward up to $3,000 contact Crime Stoppers at 1-866-845-TIPS. Clay County Sheriff's Office got a call from the Compass Bank (536 Blanding Blvd in Orange Park) about the man seen in these photos committing a robbery there at 11:36am. He entered the branch and went to the teller line to complete a transaction. He then pass...ed a note to the teller demanding money. She stated he pointed an object at her while demanding the money but the object was concealed by his pants pocket . She describes the man as 6”2, 250-275 lbs. wearing a black and blue plaid shirt with gray pants, black tennis shoes and a white ball cap. The suspect had a deep sounding voice. A dye pack was given to the suspect with the money he stole and it may cause burns to the suspect’s legs or hands if the money was in his hands or in his pockets when the dye pack exploded. 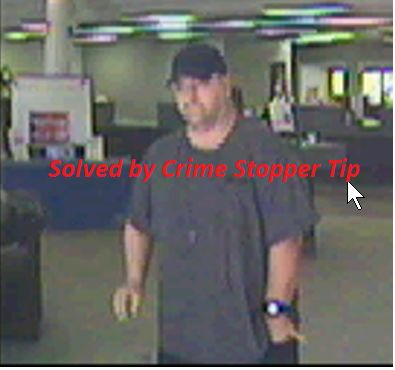 Please contact First Coast Crime Stoppers at 1-866-845-8477 you could be eligible for a cash reward for information that leads to an arrest or you can call the CCSO at 904-264-6512 to be connected to Detective Wes Smith if you know the ID of this man. Case # is 2014-012282. On Thursday, December 5, 2013 at 5:07 p.m. police were dispatched to Sin City Shop located at 819 Lomax Street reference an armed robbery to the business. 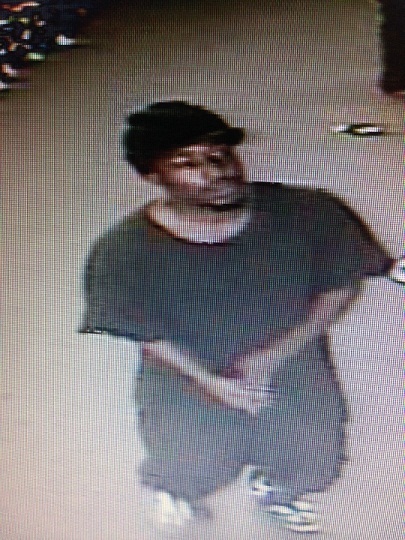 Detectives are trying to identify the unknown suspect in the photo. The suspect entered the store, pulled a handgun out of his pocket and demanded money. The suspect was given money and fled east on Lomax Street. The suspect is described as a black male, 5'7", 160 pounds, wearing a black shirt, shorts, and hat. Anyone who has any information about the location or the identity of this suspect is asked to contact the Jacksonville Sheriff's Office at 904-630-0500 or email us at JSOCrimeTips@jaxsheriff.org. To remain anonymous and receive a possible reward up to $3,000, contact Crime Stoppers at 1-866-845-TIPS. 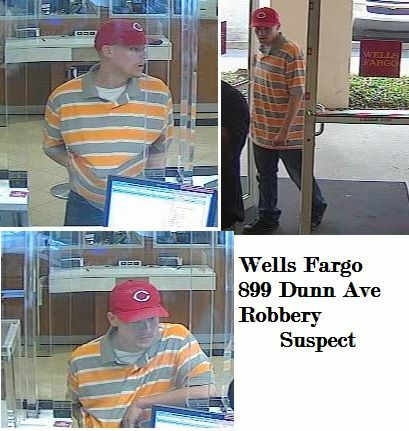 On Friday, November 15, 2013 police responded to Wells Fargo located at 899 Dunn Ave reference a robbery. The complainant stated the suspect was standing in line at the bank prior to coming to her window. Once the suspect came to her window, he handed her a note with instructions. The complaint got up from her chair and pushed the alert button. The suspect ran out of the store a short time later. The suspect was last seen running west on Dunn Avenue. The unknown suspect is described as a white male, blonde hair, wearing an orange and white shirt and striped blue jeans. Anyone who has any information about this unknown suspect is asked to contact the Jacksonville Sheriff's Office at 904-630-0500 or email us at JSOCrimeTips@jaxsheriff.org. To remain anonymous and receive a possible reward up to $3,000, contact Crime Stoppers at 1-866-845-TIPS. Armed Robbery Shell Gas Station on Cesery Blvd. 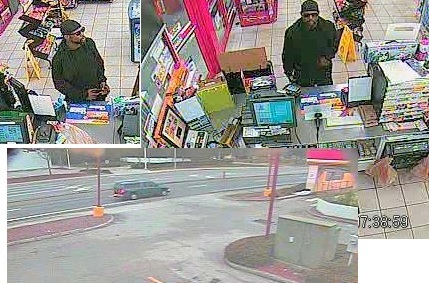 On Monday, October 14, 2013, at 11:09 p.m., the Jacksonville Sheriff's Office began investigating an armed robbery at the Shell gas station located at 1522 Cesery Blvd. The initial investigation revealed that the victim was putting air in his vehicle’s tire when two unknown suspects rushed out from behind a nearby fence and surprised him. The suspects proceeded to threaten him with a black handgun and he complied by providing them with cash, his cell phone, and his keys. The suspects then fled the area on foot in a westbound direction. Both suspects were described as a black males between the ages of 25-30 years old, 150-160 lbs, and 5’6”-5’8” tall. One of the suspects was slightly shorter than the other, wearing all dark clothes, and was clean shaven. The second suspect wore a beard and was wearing a black and red baseball cap, red and black sneakers, and had gold teeth. Anyone who has any information about the identity or location of either of these unknown suspects is asked to contact the Jacksonville Sheriff's Office at 904-630-0500 or email us at JSOCrimeTips@jaxsheriff.org. To remain anonymous and receive a possible reward up to $3,000, contact Crime Stoppers at 1-866-845-TIPS. 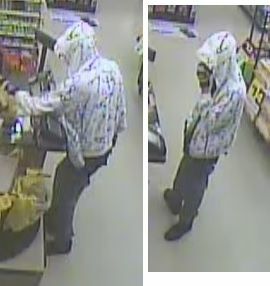 On Sunday, September 15, 2013, at 9:35 p.m., the Jacksonville Sheriff's Office began investigating an armed robbery to the Dollar General Store at 9156 103rd St. The preliminary investigation revealed that two suspects entered the store and demanded that everyone get on the floor face down. A witness stated that the suspects further demanded money from the registers from the safe and that one of them pointed a handgun in her face. Another witness told police that both suspects were carrying firearms and when they left the store they fled westbound on 103rd St. Investigators also have information that there may be a gray van with a black female driver involved in this incident. 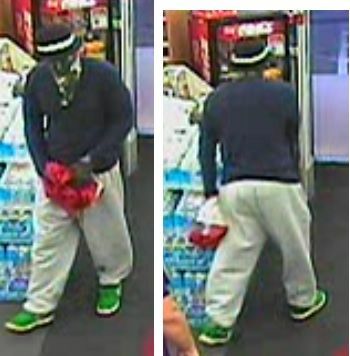 The first suspect is described as a black male wearing a red hat, a black long sleeve shirt, blue jeans and covered his face with a black bandana. The second suspect is described as a black male wearing a black and white hat, gray t-shirt, blue jeans and also covered his face with a black bandana. Anyone who has any information about either of these suspects is asked to contact the Jacksonville Sheriff's Office at 904-630-0500 or email us at JSOCrimeTips@jaxsheriff.org. To remain anonymous and receive a possible reward up to $3,000 for this case, contact Crime Stoppers at 1-866-845-TIPS. 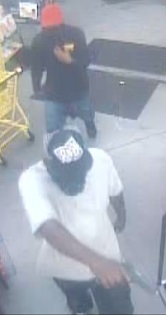 On Friday, September 6, 2013, at 8:17 p.m., an unknown suspect entered the Dollar General at 6240 Ft. Caroline Rd. with a black pistol and demanded that the witness give him money from the register and the safe. The suspect then fled the area westbound, on foot, and was last seen on Ft. Caroline Rd. The suspect is described as either a Hispanic or a Caucasian and Hispanic mix, approximately 6’2” tall, and between 150-170lbs. He was wearing a white zip up hoodie with black symbols which are possibly Chinese writing. Anyone who has any information about the identity or location of this suspect is asked to contact the Jacksonville Sheriff's Office at 904-630-0500 or email us at JSOCrimeTips@jaxsheriff.org. To remain anonymous and receive a possible reward up to $3,000 for this case, contact Crime Stoppers at 1-866-845-TIPS. On Friday, August 23, 2013 at 6:54 a.m., police were dispatched to CVS located at 5999 Normandy Boulevard reference an armed robbery. Investigation revealed an unknown suspect walked up to the counter, placed a bag on the counter, and demanded money while armed with a black handgun. Money was placed in the bag by an employee and the suspect ran from the business. The suspect is described as a black male, 20-30 years old, and 5’ 10’-5’11. The suspect was wearing a black derby hat with a white band around the hat, green bandana around his mouth, dark blue sweater, gray sweatpants, and distinctive green and white tennis shoes. Anyone who has any information about this armed robbery or the whereabouts or location of the unknown suspect is asked to contact the Jacksonville Sheriff's Office at 904-630-0500 or email us at JSOCrimeTips@jaxsheriff.org. To remain anonymous and receive a possible reward up to $3,000, contact Crime Stoppers at 1-866-845-TIPS. On Thursday, August 22, 2013 at 9:40 p.m. police responded to Arby’s located at 10160 Philips Highway reference to an armed robbery to the business. Investigation revealed the suspect entered the business, went into the bathroom, exited the bathroom and approached the front counter. The suspect removed a dark colored gun from a red purse he was carrying. The suspect demanded money, jumped across the front counter, and placed the money into his purse. The suspect was last seen getting into a dark sedan (unknown make and model). The suspect was described by witnesses as a cross-dresser, black male, 6’2”, 160 pounds, thin mustache, wearing red lipstick and a wig with long straight black hair. The suspect was wearing a white long sleeve blouse and blue jeans, carrying a red purse. On Saturday, August 10, 2013 at 4:24 a.m., police began investigating an armed robbery at the Kangaroo store located at 2952 Dunn Ave. The suspect came from the back room of the store wearing a blue/black ski mask, dark lon...g sleeve shirt, dark pants, gloves, and had a hand gun pointed at her. He further demanded that she give him money from the safe. She complied with his demands and shut her in a cooler in the store before fleeing in an unknown direction. Anyone who has any information about the identity or whereabouts of this robbery suspect is asked to contact the Jacksonville Sheriff's Office at 904-630-0500 or email us at JSOCrimeTips@jaxsheriff.org. To remain anonymous and receive a reward up to $3,000 if your tip leads to an arrest, contact Crime Stoppers at 1-866-845-TIPS. On Saturday, June 29th, 2013, at 7;55 pm, two black males approached an employee after he exited the rear door of the Firehouse Subs located at 4347 University Blvd South. The suspects then forced the employee back inside at gun point and demanded money. The suspects fled out the rear door with the money. The owners of the Firehouse Subs are offering an additional $10,000 to the Crime Stoppers reward for anyone who gives a tip which leads to an arrest in this crime. Anyone with any information about this robbery or the unknown suspects is asked to contact the Jacksonville Sheriff’s Office at 904-630-0500 or email us at JSOCrimeTips@jaxsheriff.org. To remain anonymous and receive a possible reward, contact Crime Stoppers at 1-866-845-TIPS. 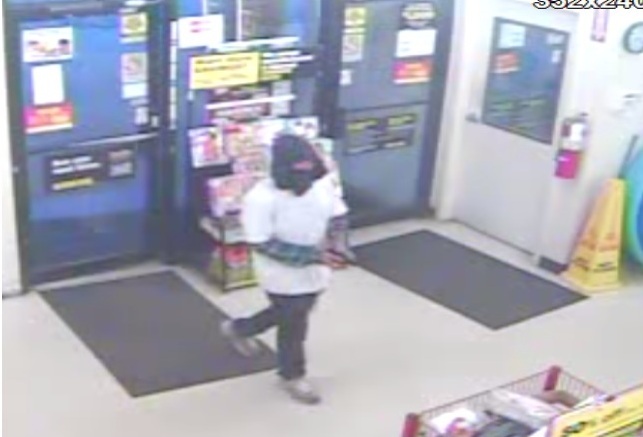 A male who robbed the Dollar Store at 1305-113 North Orange Avenue in Green Cove Springs, is being sought by police. 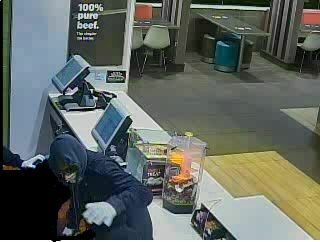 The robbery occurred at approximately 8:20PM on June 19, 2013. A Hispanic male entered the store, produced a handgun and demanded cash from the store clerk. The male then fled on foot and was last seen in the area of the St. John’s Landing Apartments, 1408 North Orange Avenue in Green Cove Springs. The suspect was approximately 5 feet 6 inches tall, and spoke with a Hispanic accent. 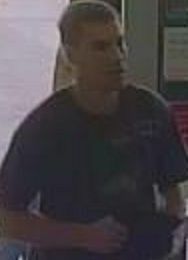 He was wearing a white T-Shirt with a green long sleeve shirt underneath, black pants, white sneakers, black hood over his head and a black or dark color cloth over his nose and mouth. The gun used was a black semi-automatic pistol. Anyone with any information about the identity of the unknown suspect is asked to contact the Green Cove Springs Police Department at 904-529-2220 or Crime Stoppers at 1-866-845-TIPS to remain anonymous and be eligible for a reward up to $1000. 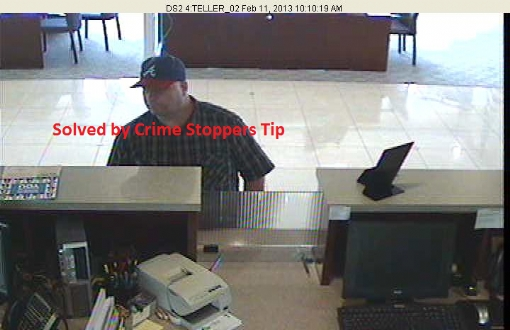 This is an updated photograph of therobbery suspect from Atlantic Coast Bank in Jacksonville Beach. The photograph below is the only updated information we have at this time. If you have any information regarding this subject please contact the Jacksonville Beach Police Department at 904-270-1661. To reamian anonymous and receive a possible reward for information leading to the arrest of this suspect, call First Coast Crime Stoppers at 1-866-845-TIPS (8477). 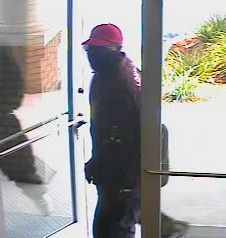 On Monday, February 11, 2013 at 10:14 a.m. a bank robbery occurredto The Jacksonville Bank located at 14288 Beach Boulevard. Investigation revealed an unknown suspect, entered the bank,handed the teller a note demanding money, received money and fled the scene. The suspect is described as a white male, 40-47 years old, 6’,250-280 pounds wearing an Atlanta Braves baseball hat. Anyone with any information about this robbery or the unknownsuspect is asked to contact the Jacksonville Sheriff’s Office at 904-630-0500or email us at JSOCrimeTips@jaxsheriff.org. To remain anonymous and receive a possible reward, contact Crime Stoppers at 1-866-845-TIPS. On Saturday, November 3, 2012 at 1:58 p.m. police were dispatched to Wells Fargo located at 4206 San Juan Avenue. Investigation revealed an unknown white male entered the business,approached a teller, insinuated he had a weapon, and demanded money. The suspect was described as a white male, between 5’7”-5’10”,thin build, dark hair, and had a mustache. 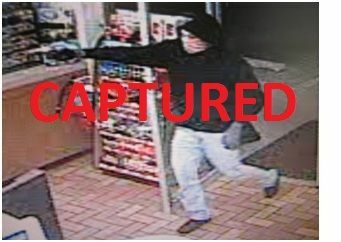 The suspect was wearing ablack hoodie sweatshirt, jeans, and a Boston Red Sox baseball cap. The suspect was last seen running outside the business. Poice are trying to identify this suspect in the robbery of Wells Fargo Bank located at 11415 Beach Boulevard. 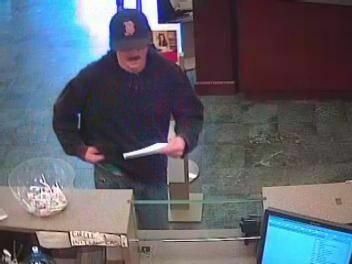 On Tuesday, 9/4/12 at 10:52am, the suspect entered the bank and gave the teller a note. No vehicle was seen. On Sunday, July 15, 2012 at 12:36p.m. police responded to the TD Bank located at 6050 Old St. Augustine Rd.in reference to a bank robbery. Investigation revealed that a black male, wearing a cap, scarf, long sleeve button down brown shirt, sunglasses and a jacket ran into the premises from the front door. He shouted “Give me the money, I’ve got a gun”. A witness on the scene observed a gun. The suspect requested money and fled the scene. A man who robbed an ABC Liquors store on the Westside last week is being sought by police.The man robbed the store in the 1100 block of South Lane Avenue about 11 p.m. July 2. The man was seen on surveillance video jumping of the store counter with a rifle. Police said he ordered store employees on the floor and took cash. First Coast Crime Stoppers announced at the store Wednesday that a $6,000 reward -- $5,000 from the store and $1,000 from Crime Stoppers -- is being offered for information leading to the robber's arrest. Wyllie Hodges, executive director of Crime Stoppers, said the man should turn himself in or else his friends will turn him in for the high reward. "Trust me, your friends are not that friendly. They are going to turn you in," Hodges said, addressing the robber. "Someone is going to call about this. To your friends: You know who it is. You know where he lives. You know where he hangs out. And you are going to call us? I know you are." Anyone with any information about the man's identity or whereabouts is asked to call Crime Stoppers at 866-845-TIPS. Callers will remain anonymous. 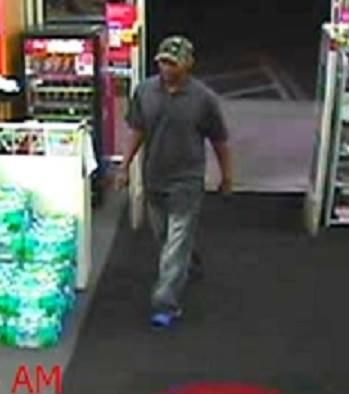 On Tuesday, June 12, 2012 at around3:30AM, Union County Sheriff’s Office received a report of an unknown blackmale that entered the Lake Butler – Kangaroo Store at the corner of SR121 andSR231. Unknown black male entered the KangarooStore pointing a gun at the cashier and demanded money. The suspect is described as approximately 6feet tall, slender build and was wearing a black sweat shirt with a hood, bluejeans, dark colored shoes and a mask over his face. The suspect waved a silver colored revolverat the cashier. The suspect left thestore within seconds of entering. Department of Corrections K-9 units anddeputies from the Union County Sheriff’s Office conducted a citywide search ofthe area and tracked the suspect a short distance. The suspect was captured on videosurveillance and is being investigated for links to other crimes. Any information please contact Major Garry Seayat 386-496-2501 or you can remain anonymous by contacting First Coast CrimeStoppers 1-866-845-TIPS (8477) and be eligible for a cash reward up to a $1,000.